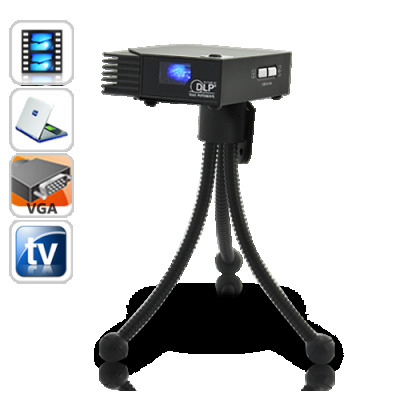 Successfully Added Mini DLP Pico Pocket Projector (VGA, AV) to your Shopping Cart. The smallest Projector on the market: meet E193 Mini DLP Pico Projector which features DLP technology to bring you crystal clear images and can be put in your pocket and carried anywhere you go. Slightly bigger than a Zippo lighter, the E193 is a stylish DLP projector made with solid aluminum and hard molded plastic. Inside is where you find the ultra-efficient optical engine, the DLP (Digital Light Processing) technology from Texas Instrument which makes a projector as small as the E193 possible. It displays images at resolution of 860x480 pixels and 20 lumens, meaning that even at normal light environment without the light off, the E193 still produces clear images. The E193 comes with both VGA and component cables to connect to Laptop, PC, TV, or DVD player to view movies, photos or play games. It’s also a perfect accessory to bring along for making presentations. On your next business trip, instead of taking a bulky LCD projector, you can simply slide the E193 into your pocket and you are ready to go. If you’re looking for the ultimate portable projector with professional features, then this mini projector is a great choice. What’s more, the E193 Mini DLP Pico Pocket Projector comes with a full 12 month warranty and is in stock in our warehouse right now. Order today and we will express ship out your order tomorrow. From your reliable source for cool electronic gadgets, Chinavasion. Please adjust your PC’s display resolution to 800x600 before connecting to the mini DLP Pico Projector. When connected with computer or DVD player, please use the USB charging cable to power the projector at the same time. Connect to any device with AV output. Can I project images onto a wall or do I need a special screen? You can project images just about anywhere. A white wall will work best. A white screen is not necessary but can be used. How bright is this projector? Bright enough to use under normal indoor lighting conditions. However, it is recommended to get the room as dark as possible for the best user experience.